NASA's satellite probe MESSENGER has finally reached Mercury, passing by as it gradually slows itself to enter orbit in 2010. Since it was in the vicinity, NASA took the opportunity to obtain some images of the planetary surface. This is the first time a satellite has revisited Mercury since Mariner 10 in 1974-75. Because of the orbital mechanics of Mariner, it only photographed 45% of Mercury's surface, so NASA has focused on presenting images of the hitherto hidden side of the planet. Before looking at some of the new MESSENGER images, let's briefly review three of the key aspects of Mercury's planetary geology that Mariner 10 illustrated over 30 years ago. First, Mercury has an Fe-Ni core that is proportionally way bigger than predicted by the classical theory for the formation of the Rocky Planets. ... where we can see impact craters with peaks, double-ring impact craters, old flooded impact craters, young ejecta rays, and ridges. There's nothing here that Mariner didn't already show us, but the quality of the image is very good. At first glance, depending on where you look, the surface of Mercury seen through MESSENGER's eyes is rather similar to Earth's Moon. However, elsewhere there are major differences, some of which were already spotted by the old Mariner probe, and are now very nicely illustrated by MESSENGER. ​At first glance, depending on where you look, the surface of Mercury seen through MESSENGER's eyes is rather similar to Earth's Moon. However, elsewhere there are major differences, some of which were already spotted by the old Mariner probe, and are now very nicely illustrated by MESSENGER. Here's an image with two large craters. The older one is a double-ring crater that has been filled to the brim by volcanic lava that blends into volcanic plains that are themselves peppered with younger impact craters. The younger one has a flat floor flooded by volcanic lava - but note the very rough, pockmarked texture of the planetary surface immediately adjacent to it. Similarly, in a second image you can see two very different landscapes. In the North are old impact craters which are separated from each other by extremely rough pockmarking. In contrast, the central and southern parts of the image show an extensive, shapeless, smooth region made of volcanic lava cut by fewer, smaller impact craters, but you can also see that the lava plains have flooded and drowned larger, older craters. These features are very different from Earth's Moon where heavy pockmarking is rare, and where extensive lava plains are confined to the interiors of well defined, more or less circular Impact Basins. ​A third image shows a detail of the volcanic plains flooding older impact craters and their pockmarked shoulders. Now consider a more detailed MESSENGER image that shows a large crater (right) surrounded by pockmarked terrain. Notice the radial crater chains associated with the pockmarking. The crater chains are formed by debris ejected from the impact crater, and this tell us that the associated pockmarks also represent locally derived debris that was tossed up above the impact site and fell very close to the impact crater. This is very different to the behaviour of impact debris on Earth's Moon that is ejected so far that it can fly halfway round the Moon before landing, such as those bright rays we can see extending from the crater Tycho in the Moon's southern hemisphere. So why the difference ? Gravity ! Mercury is about 40% the size of the Earth, but because it has an unusually large Ni-Fe core it's average density is about the same as that of the Earth, all of which adds up to about 40% of the Earth's gravity. However, the Moon, at about 25% the size of the Earth, with a very small Ni-Fe core, has less than 25% of the Earth's gravity. Therefore, impact debris doesn't fly as far on Mercury as it does on the Moon. So we can now summarise the essential elements of impact features commonly present on Mercury, as seen by MESSENGER. Double-ring craters do occur on Earth's Moon, but they are much more common on Mercury, and smaller in size. Again, this is a function of Mercury's greater gravity. The immediate vicinity of the impact crater is pockmarked by locally derived impact ejecta associated with radial secondary impact crater chains. Finally, it just so happens that in this summary image, in contrast to previous images in this presentation, the impact and pockmarking is clearly younger than the smooth volcanic plains to the left of this image. Because the major phase of impact cratering in the Solar System is associated with the Great Bombardment that ended at ~3.8 billion years ago, the presence of smooth lavas that drown older craters - but which are also heavily impacted by younger ones - tells us that the lava plains are probably about 3.8 billion years old as well. This highlights yet another difference with Earth's Moon, where the lavas that filled up the giant Impact Basins are 100's of millions of years younger than the end of the Great Bombardment. Changing focus, the most obvious feature in this MESSENGER image is the large double-ring crater, but the most interesting features are contractional ridges - the largest of which runs from upper left to lower right. Let's zoom in on two areas in the upper left and centre fields (yellow boxes). This is an incredibly detailed MESSENGER image of a section of the contractional ridge in centre field of the previous image. If you look very carefully you can see how the planetary crust on the right has moved westwards over the crust on the left and partially buried the small crater near the middle of the image. You can literally see how the mercurial crust moved during planetary contraction. Note how it cuts SSW across the floor of a major impact crater in the upper left corner of this image, and forms a scarp high enough to cast a striking shadow. As it cuts across the terraced crater rim, the contractional ridge turns to run SSE towards the lower right where it is cut by a younger impact crater. Despite accommodating enough movement to form a marked scarp, the displacement on the contractional fracture was not enough to off-set the old crater rim. This minor movement is characteristic of Mercury's contractional ridges all over the planet. ​This image is also a detail of a curved (SSW to SE) contractional ridge cutting across an older terraced impact crater rim, located to the NW of the previous image. It too is cut by a later impact crater. A collage of Mariner (right) and MESSENGER (left) images of the Caloris multi-ring Impact Basin illustrates the effect of sun angle on planetary photography. The multi-ring basin is much better resolved in the older Mariner images because the sun angle was very low (note the shadows in the associated impact craters). In contrast, the basin is invisible on the MESSENGER image where the absence of shadows in impact craters shows that the sun angle was much higher. The sensitivity of mercurial topography to sun angle is yet another illustration of the effect of gravity : the multi-ring ridges are much lower than those on the Moon and require a low sun angle to be visible. 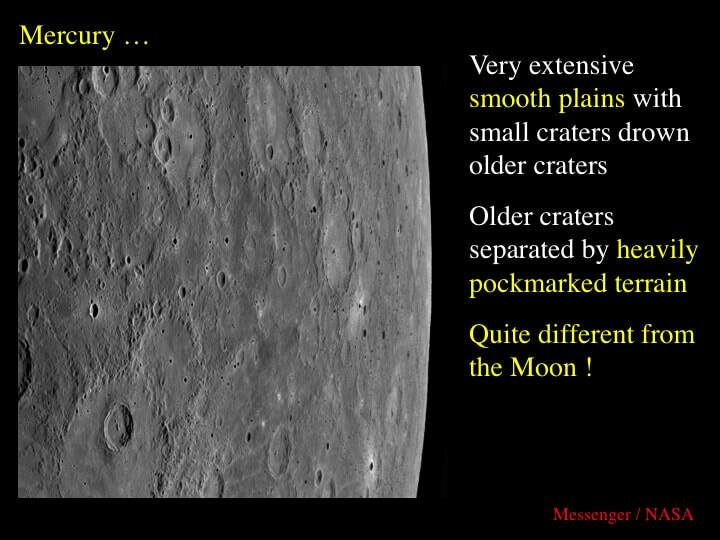 The last MESSENGER image in this presentation is the one that NASA is making a lot of fuss about; unnecessary fuss ! This feature is an array of radial fractures some several 100's of kilometres across. In typical NASA fashion, they call it the "Spider" and associate it with the impact crater near its centre (centre is yellow circle). If the impact crater was really associated with all these radial cracks, it might indeed be a unique feature in the Solar System - as NASA claims. But it's nothing of the kind, the crater is clearly off-centre and is a late feature that formed after the radial fractures. Now let's look at this image through geological eyes. If you look carefully in the lower centre field, you can see that a "fracture" is clearly more than a simple "crack". It is a narrow rift valley with a flat valley floor, and if you look very carefully you can see that this is the case for all the radiating features. This is a very common feature on Earth. Radiating mini-rift valleys represent a failed volcano, albeit a very big one here on Mercury. Lava (molten rock) rose as a narrow plume from the planetary interior - but did not reach the surface, so it pushed up the planetary surface which cracked radially as it bulged and stretched. The lava ran out radially along the cracks and - as it cooled and crystallised to form solid rock - it shrank. As the injected lava shrank - the roof of rock above the vertical lava sheet dropped down to form the narrow mini-rift. Such features are known on Earth and on Venus where even larger versions are referred to a radiating dyke swarms. MESSENGER has sent us back some wonderfully detailed images. Geologically speaking, there's nothing new that the old Mariner probe hadn't already shown us (except for the "Spider"), but the new images are extraordinarily detailed. The "hidden" side of Mercury does not contain any unexpected surprises.